Twenty-two-year-old Hailey resident Jasmine Campbell is headed to the 2014 Winter Olympics to compete for the U.S. Virgin Islands. Campbell was born on the Caribbean island and moved to Idaho when she was nine. Campbell is a student at Whitman College, but she's taking the year off to train for the Games. "It's just basically an 18 hour job where I'm always thinking about skiing," Campbell told the Northwest News Network. "I wake up in the morning, before going upstairs, I watch a ski video. When I go to bed at night I watch a ski video. During the day, I have double training sessions." Campbell on the 2014 Sochi Games: "It is a tremendous honor and privilege to compete in the Olympics. I want to ensure that I ski to the best of my ability so that I may represent my birthplace in the most honorable way possible. At Sochi, I want to perform in a way that makes my countrymen proud, and gives the sport the respect and dedication it deserves," says Campbell. Campbell is taking a year off between her junior and senior years at Whitman College in Walla Walla, Washington to pursue her Olympic dreams. At Whitman, she is double majoring in psychology and philosophy. "This Olympic odyssey may well have helped direct me to a potential career path in sports psychology," Campbell says. Next month, Sochi, Russia will host athletes from more than 85 nations at the Winter Olympics. Some of those countries might surprise you. They get no snow or have no mountains. Remember the Disney movie "Cool Runnings?" It immortalized the Jamaican bobsled squad. Team Jamaica is coming back for more this year. And so is the U.S. Virgin Islands. The U.S. territory will likely be represented by a Whitman College student who calls Sun Valley, Idaho home. Idaho native Sara Studebaker is two weeks away from skiing and shooting in her second Olympic Games. Studebaker, a Boise High School graduate, has been competing in the biathlon since 2003. 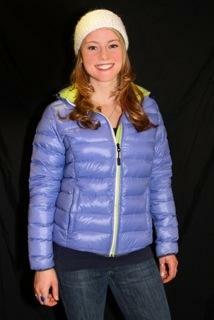 Now, at 29-years-old, Studebaker says she's ready for Sochi. It's looking more and more like Northwest athletes will be unusually well represented at the Winter Olympics in Russia next month. The U.S. Olympic Nordic team was named Wednesday.